So, I am very excited about an early birthday present I am getting from hubby. 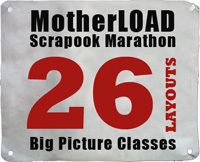 I am going to be doing LOAD! All projects (except the one from Gummy Lump) came from here. 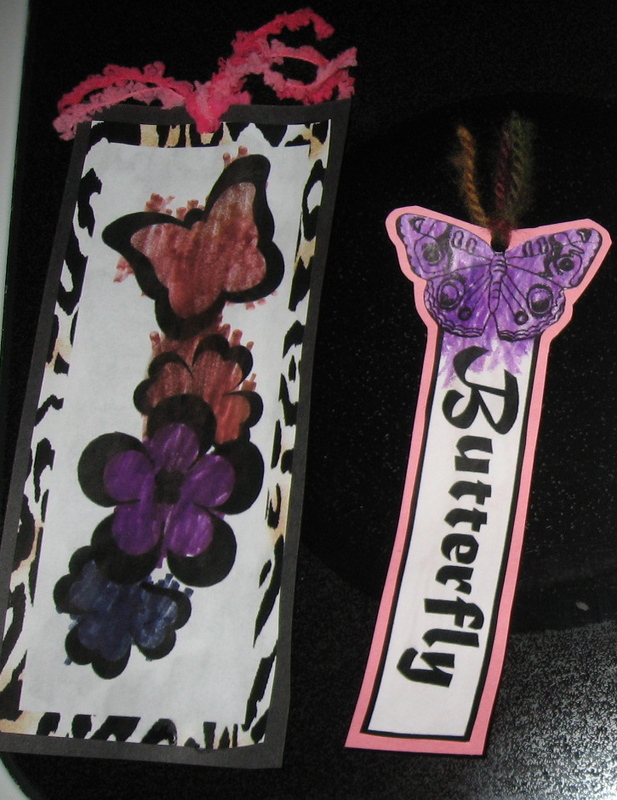 A few notes about the butterfly craft: I cut out the butterfly by tracing around a picture of a butterfly I found on the internet, and then freehand cut the body out of brown construction paper. 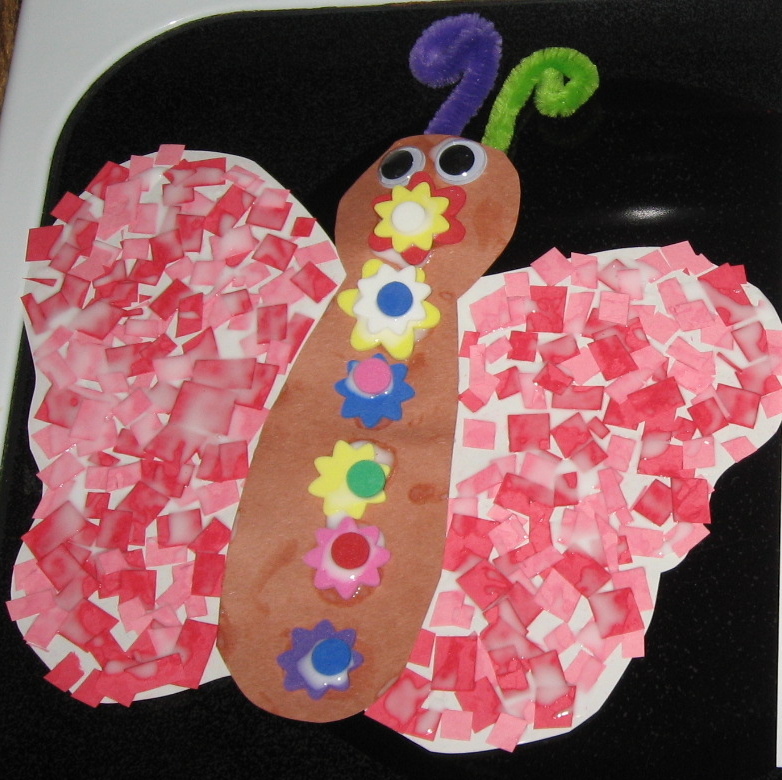 They recommend using sticker paper for the butterfly, but I found the small pieces did not stick, so I ended up going back and adding a bunch of additional glue (which looked fine after it dried-it was just kind of a pain.) 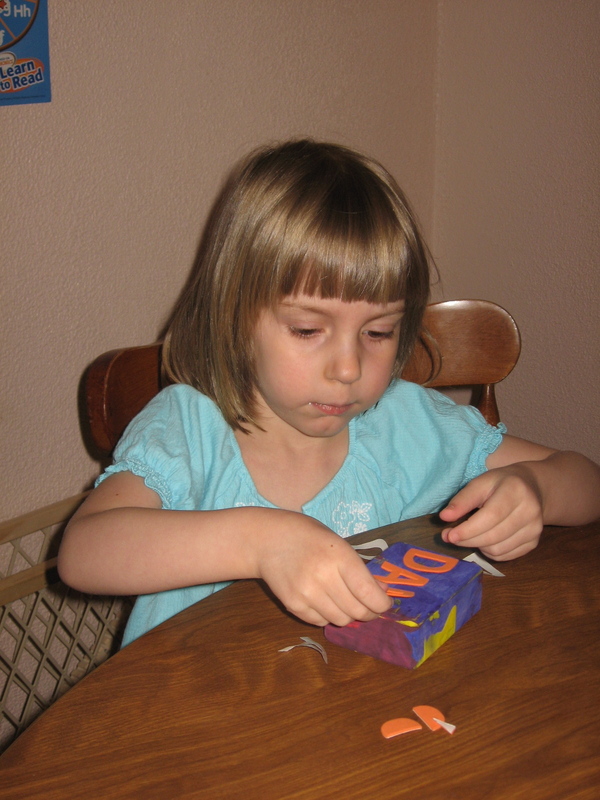 Regular paper and glue would work just fine for this craft. Have fun!! Echo Park and My 100th Post! Well, I can’t believe this is my 100th blog post already-cool! To celebrate, I am posting three of my favorite Echo Park projects from the last month. I used my Silhouette quite a bit on this layout. Everything is from Echo Park’s Summer Days collection except for the grass which is Echo Park Happy Halloween. 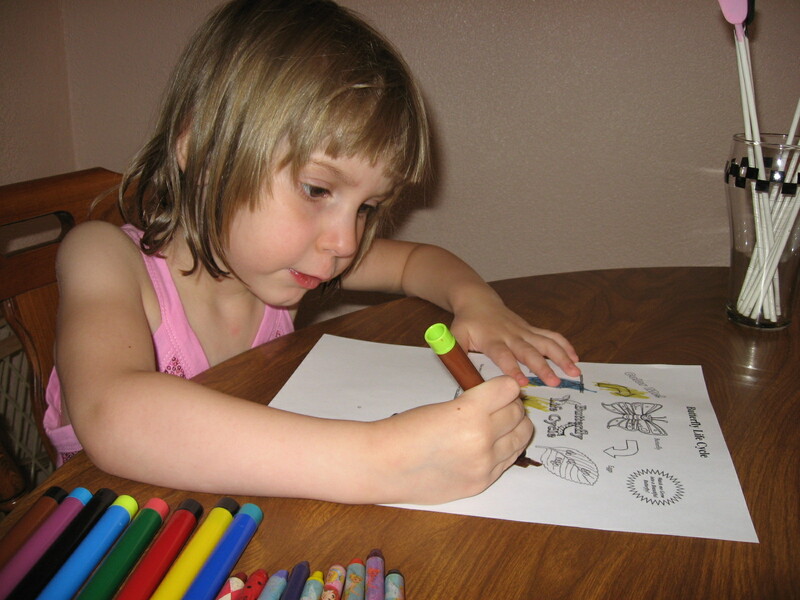 Other supplies used include Studio Calico Bonnie Blue Mr. Huey, and my Zig and Signo pens. 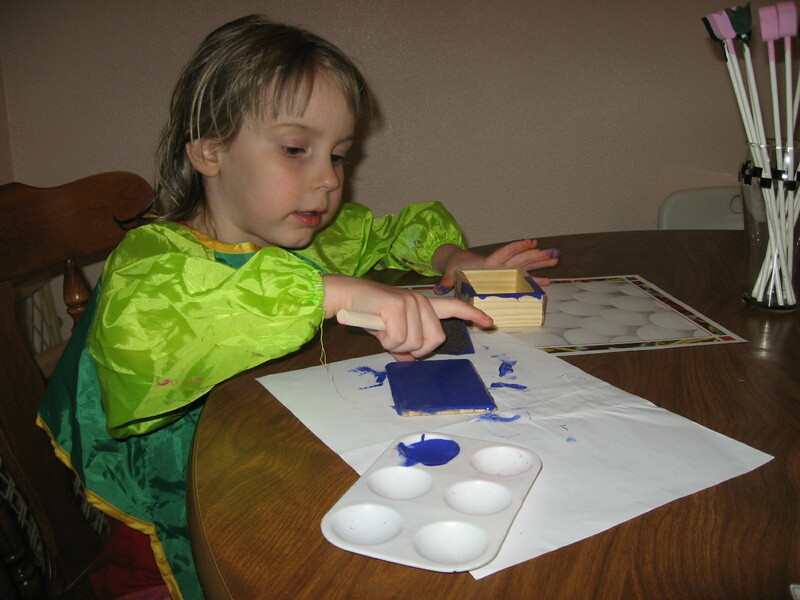 Here are some instructions you can use to recreate this project! 1. To create the sky portion, I diecut a sun using the Ice Cream paper (b side) and my Silhouette (you could easily cut your own sun if you don’t have a Silhouette by cutting or punching out a circle and several strips of paper.) I combined that with stickers from the Sticker Sheet along with a couple of clouds and a border I trimmed from the Summer Days index sheet. I used pop dots on a few of the cloud stickers for extra dimension. 2. To create the grass, I hand-cut a grass border and a few flowers from the index sheet, and then diecut additional grass from Echo Park Happy Halloween Spider Web paper using my Silhouette. 4. The “enjoy” word was cut on the Silhouette. I removed the letters, and sprayed the negative leftover with Bonnie Blue mist, and adhered it to the Rainbow paper. 5. 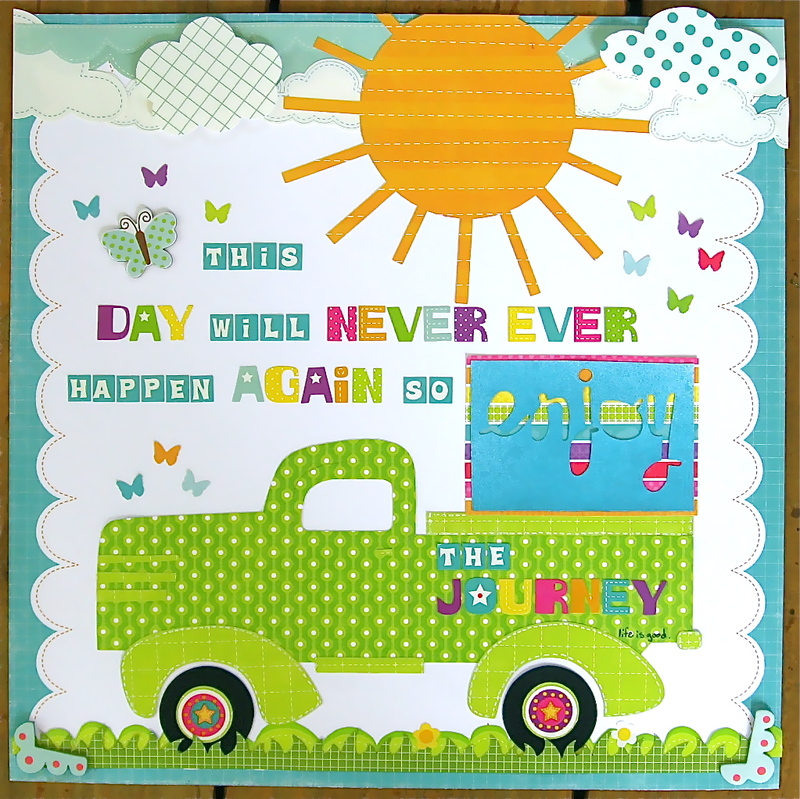 Final details-I adhered everything to the Diecut sheet (including the letter stickers), added a Summer Days chipboard butterfly and photo corners, added stitching on parts of the truck with my white Signo pen, and the words “life is good” using my Zig pen on the body of the truck. 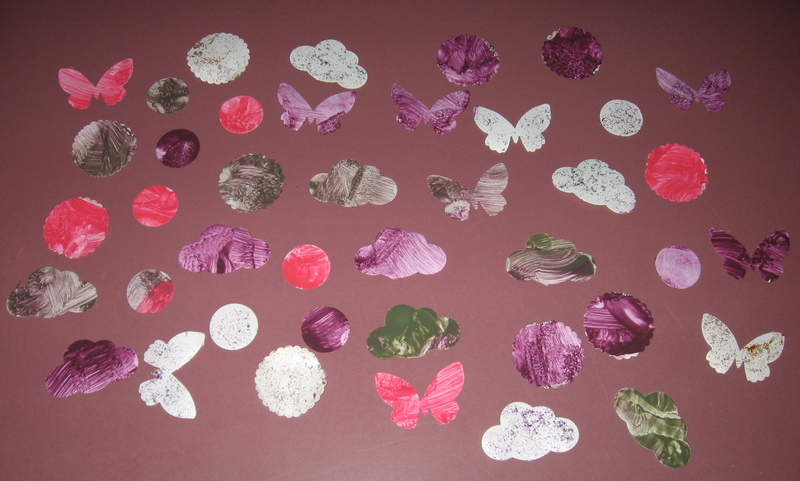 I also punched several butterflies out of Big Dots paper using my Martha Stewart butterfly punch and adhered them to the page. Fun, huh? I love the cheery results, and am looking forward to hanging this up! This next project I posted last week, but it is definitely one of my favorites. 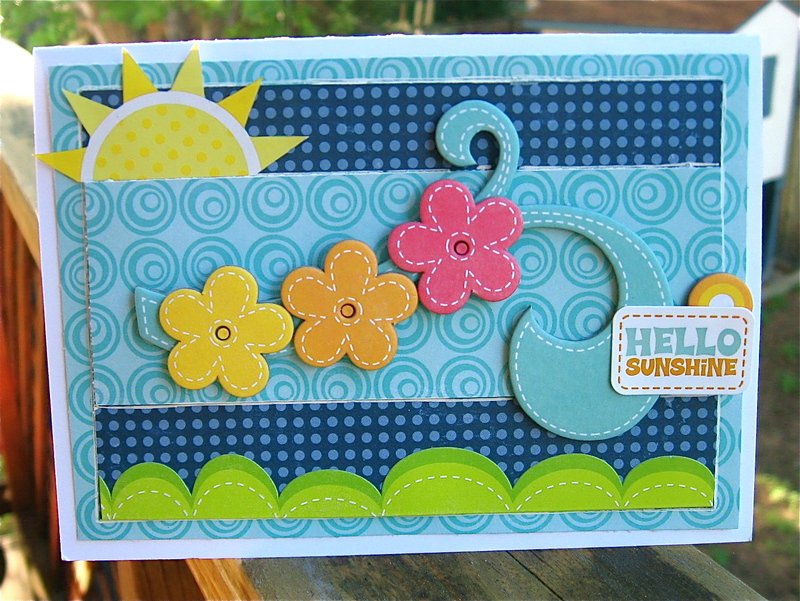 This card was made completely with Summer Days. I used the index sheet (part of the packaging), and cut a rectangle and heart out with my Silhouette. I then adhered it to the Scallops paper (side b.) I added stickers from the Sticker Sheet-cutting the words so and you out of phrases, and using an upside down letter i for my exclamation point. I stitched around the inside of the heart shape, adhered everything (using pop dots for added dimension under two words), and there you are! I really like the touch the stitching added, and I think I will try that more often in the future. 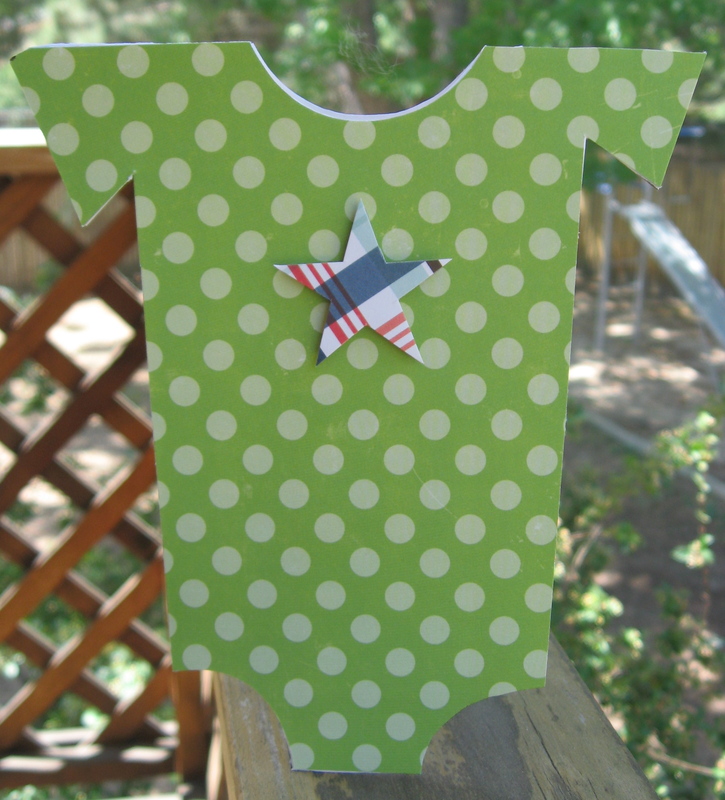 This card will be perfect for a new baby boy or a toddler boy birthday card. I purposely left it generic so that I can personalize it later to the occasion. I used the Little Girl clothesline Silhouette design from Echo Park. 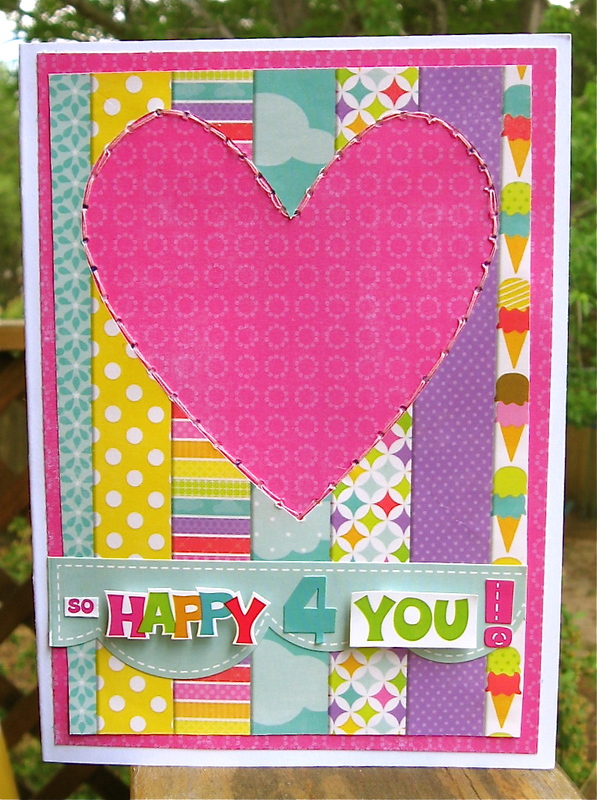 I chose just the onesie design and enlarged it (approximately 6 inches tall and 5 inches wide) to create the card. I used the B side of Little Boy Sailboats for the body, and trimmed the airplane and the red stripes out of Little Boy Borders. So, there are my three favorite Echo Park projects from this month. Which is your favorite? I recently got a huge box of free goodies from Consumer Crafts-THANK YOU!!!! I won a $100 gift certificate from them, which was so exciting! At first, I was thinking of all the people I could get gifts for, but my hubby encouraged me to buy stuff just for me. 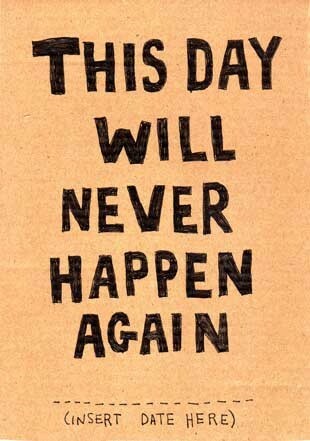 So, I did. With one exception. This little wooden box. Why? 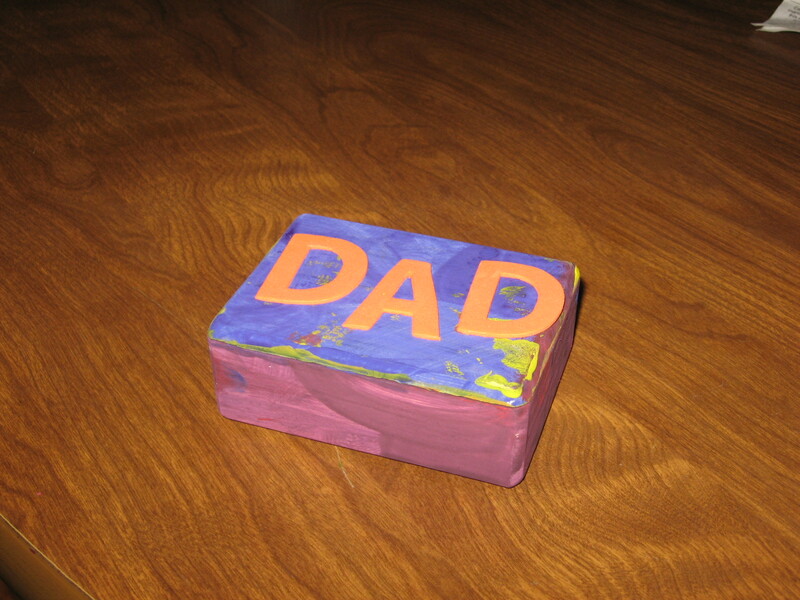 Because I knew it would be the perfect thing for The Girlio to give to hubby for Father’s Day. And there you go-a cute, easy project and a present to boot! 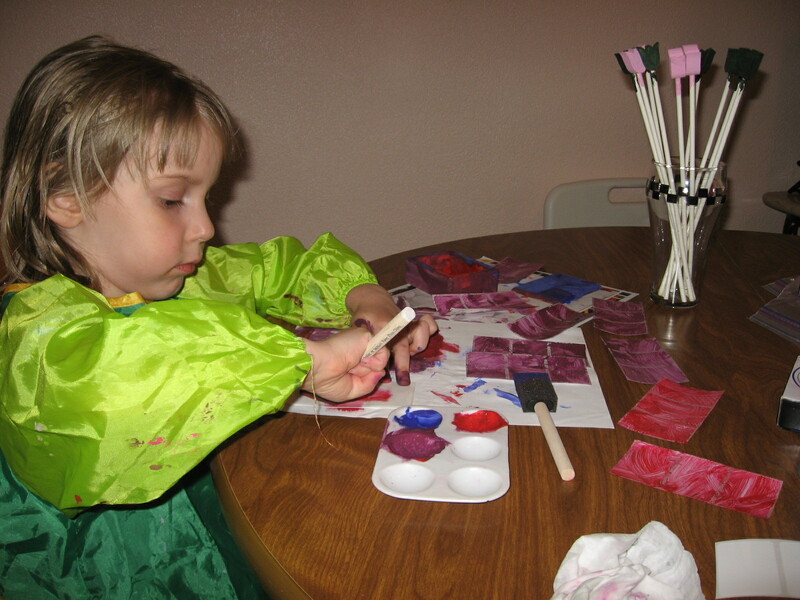 Oh, and then she decided to paint 40 more sticker labels. This card was made completely with Summer Days. I used the index sheet (part of the packaging), and cut a rectangle and heart out with my Silhouette. 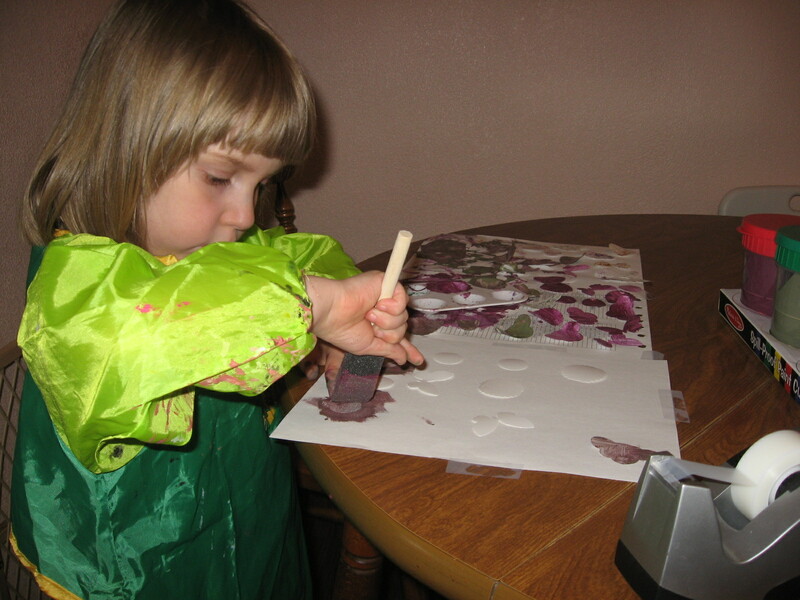 I then adhered it to the Scallops paper (side B.) I added stickers from the sticker sheet-cutting the words so and you out of phrases, and using an upside down letter i for my exclamation point. I stitched around the inside of the heart shape, adhered everything, and there you are! I really like the touch the stitching added, and I think I will try that more often in the future. 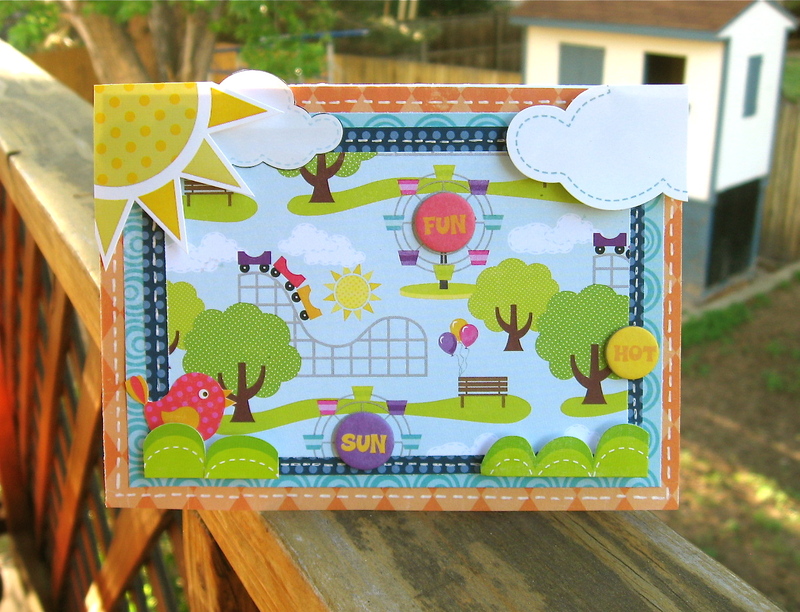 For this card, I used Summer Days and Little Boy paper, and some Summer Days stickers and chipboard. 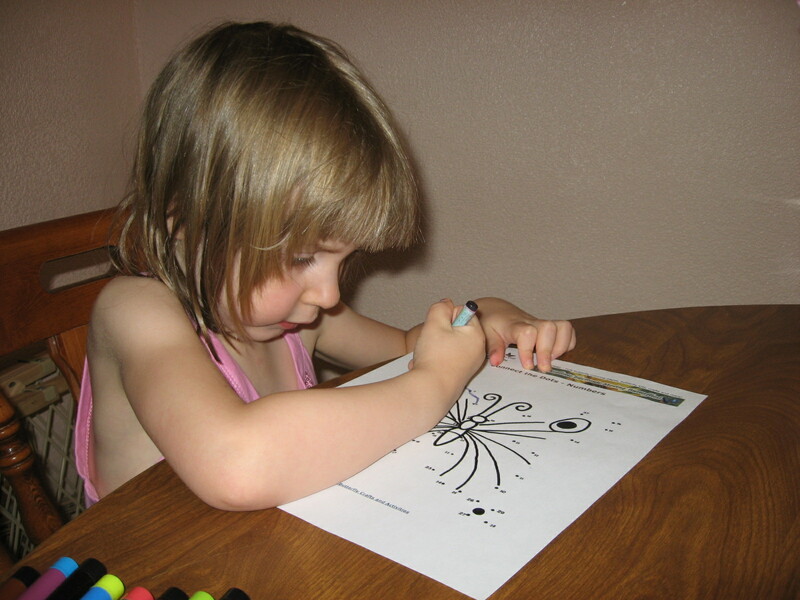 I outlined the paper pieces with white pen, and cut the sun out of the Summer Days index sheet. 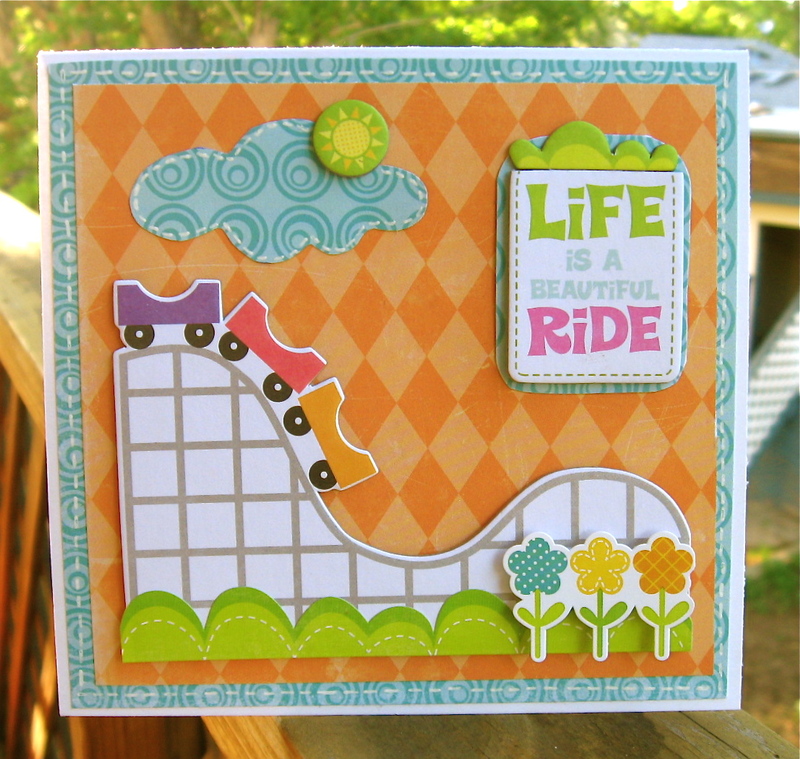 This card uses the Happy Halloween, Little Boy, and Summer Days collections. I added some depth with pop dots, and faux stitching with my white pen. 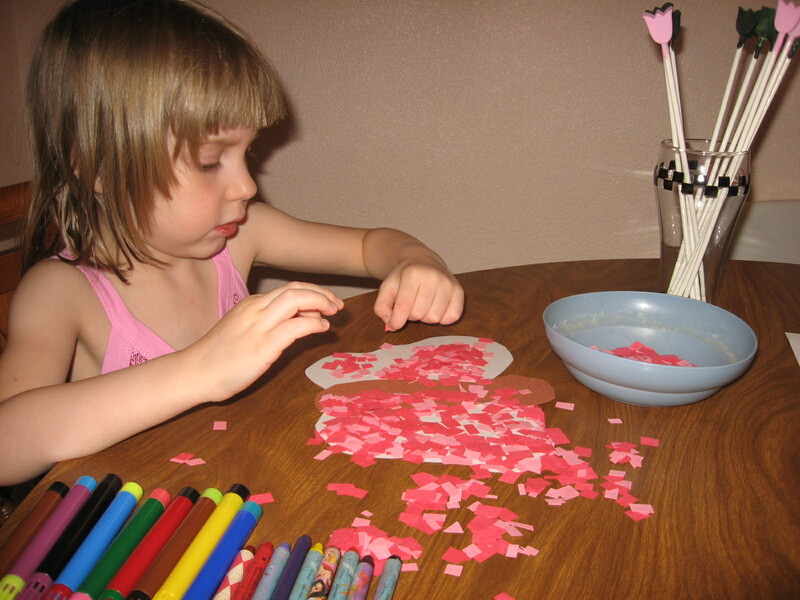 The chipboard and stickers are from the Summer Days collection. I cut the smaller cloud and the bird out of the Summer Days index sheet. This card has Happy Halloween and Summer Days papers, and chipboard and stickers from Summer Days. I traced the cloud from the negative space left over from a chipboard Summer Days cloud, and used my white pen to add stitching, and pop dots for dimension on the flowers. I had so much fun making these cards, and just typing this up makes me want to go create more!! Off I go!!! So, I was still trying to figure out what to do with the rest of the giant roll of labels hubby brought home. We used some last week for our craft, but there are a LOT left. 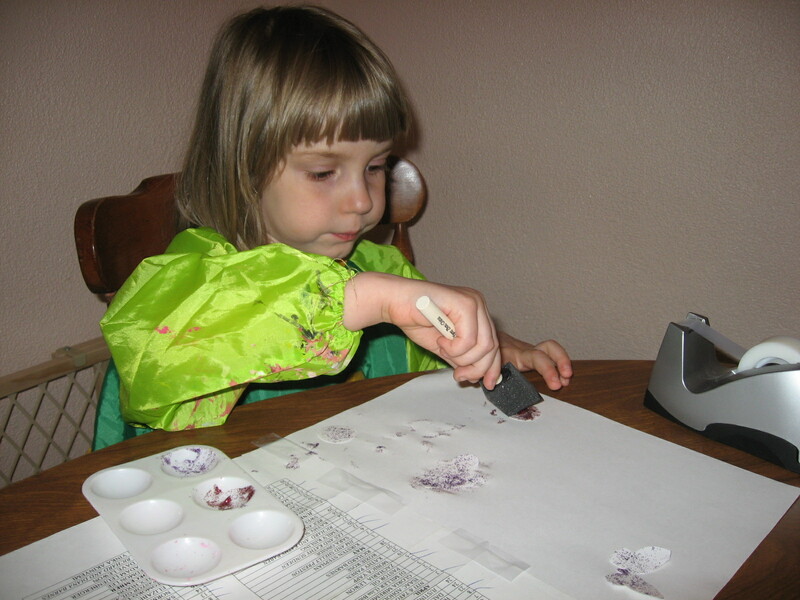 Then I came up with the idea of using my punches! I found four punches that were the correct size and punched ten of each shape. 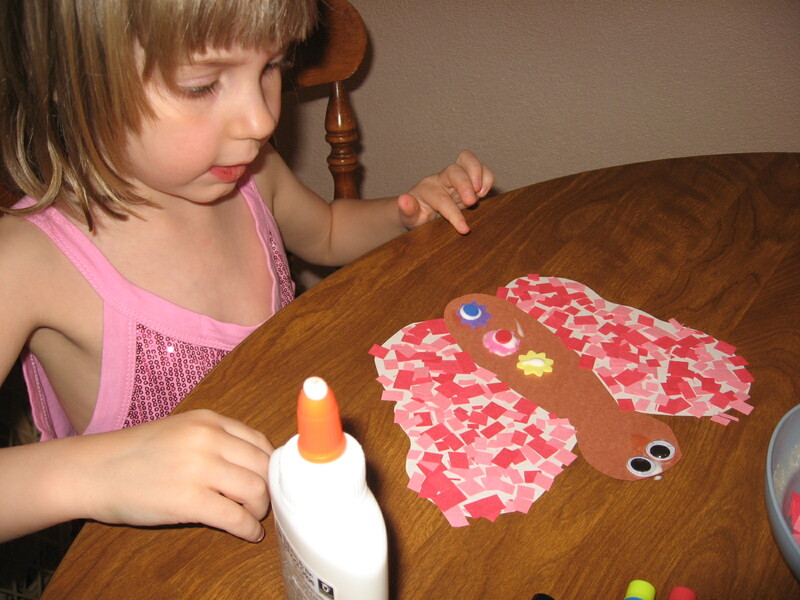 Then, The Girlio used glitter glue and paint to decorate them, and now she has 40 of her own custom stickers to use on her projects! How fun! I am a little behind sharing my projects here. Had family in town, and then some sick ones to care for! So, to start the catch-up, here are some onesie cards I made a few weeks back with my Silhouette. I am really loving the combination of using my Silhouette with Echo Park products-just can’t seem to get enough! These cards will be perfect for new babies or baby/toddler birthdays. I purposely left them generic so that I can personalize them later to the occasion. I used the Little Girl clothesline Silhouette design from Echo Park. 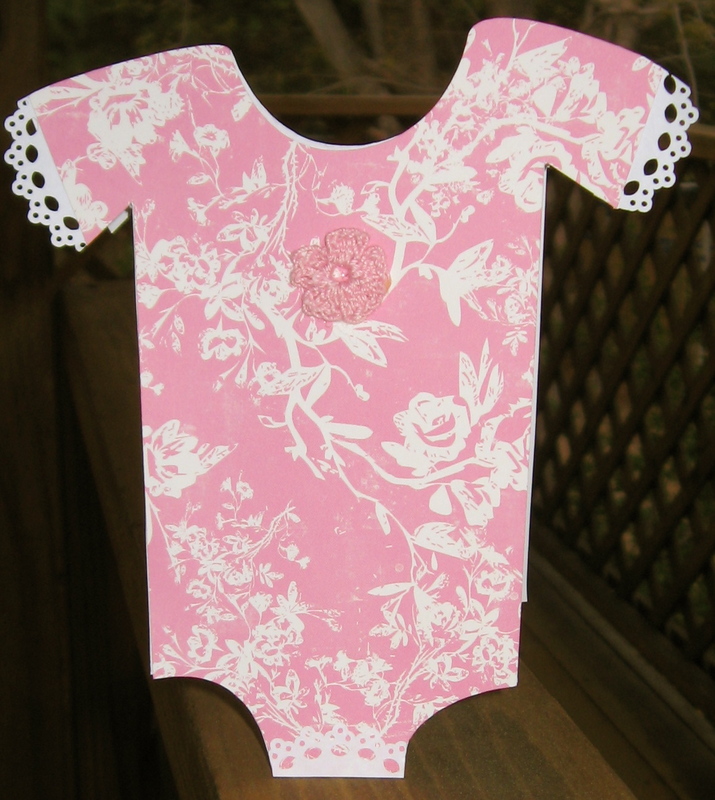 I chose just the onesie design and enlarged it (approximately 6 inches tall and 5 inches wide) to create the cards. 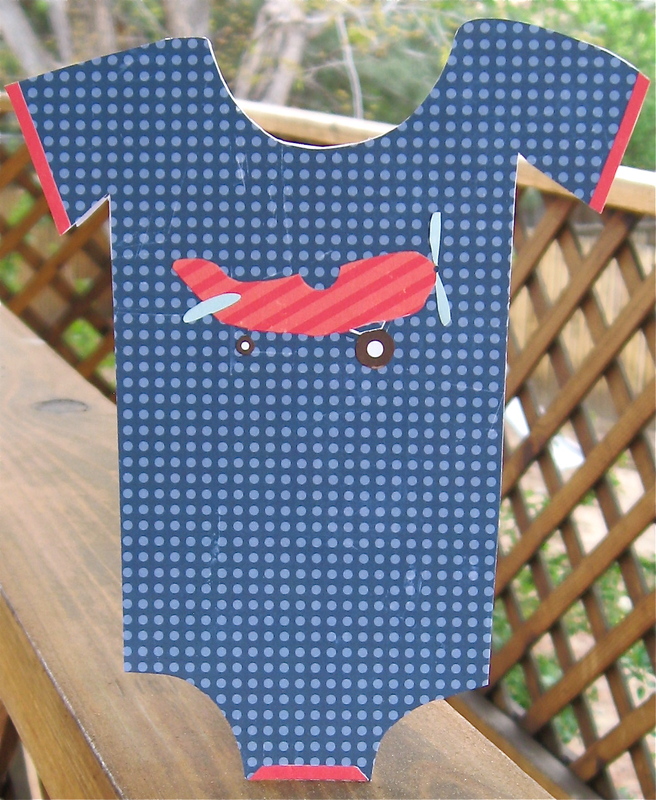 I used the B side of Little Boy Sailboats, and cut the airplane and the red stripes out of Little Boy Borders. This last one was made with both sides of the Little Boy Rad Plaid paper. I made it for a Paper Variety challenge to use stars. I cut the sleeves off on the top for a little bit of a different design. The chipboard star (covered by the plaid) is by Bazzill.